Olga Galanaki is a Greek Pianist/Keyboardist, Piano/Keyboard Instructor & Music Creator who specializes in contemporary music. She started studying music since she was 7 years old. Olga has studied classical piano for 12 years and theoretical courses of music. She is a graduate of Music Technology, Theory/Harmony of jazz, Music of Miles Davis, Contemporary music & Jazz/Modern Piano, MusicTherapy. Her career as a professional musician began in 2006. 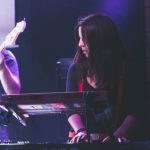 Olga has collaborated (live/studio) w/ many musicians, singers and bands, mainly with rock, pop-rock, jazz, latin, blues, funk, soul, r’n’b, disco etc. genres, such as Rous, Nektarios Sfirakis, Thanos Kalliris, Jamming Funkers, Rallia Christidou, Nikos Mixas, Johnny Skoulas, Sax-S band, 4 on the Floor band, Sylvia Efthymiou and others. Some of the venues Olga has played: Stavros tou Notou, ΚοοΚοο bar, Texnopolis, Architektoniki, Gyalino Up Stage, Faust Bar theatre, Galaxy Bar/Restaurant-Hilton Athens, Kerameio Bar, Afrikana, Half Note Jazz Club, Gazarte, PassPort, Roadtrip & The Workshop (London,June of 2012), Ejekt Festival 2013. She teaches Jazz/Modern Piano, Keyboards, Sound Technology of Keyboards-Synthesizers, Theory/Jazz Harmony to children & adults (beginners and more advanced) – online music lessons-via Skype-are also available.